Photograph of the Special Rapporteur on Disability seated at the podium making his presentation to the Commission for Social Development at the 48th Session on 5 February 2010. 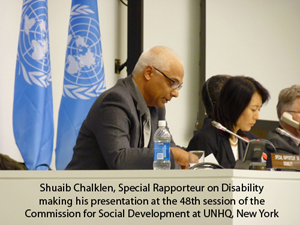 Shuaib Chalklen of South Africa has been appointed the Special Rapporteur on Disability of the Commission for Social Development for the period 2009-2011. The newly appointed Special Rapporteur is a prominent leader who has made extensive contributions to the advancement of persons with disabilities within both regional and global frameworks. Mr. Chalklen earned a bachelor’s degree in social science from the University of Cape Town in 1991. He also studied at the University of Manchester Institute of Science and Technology and at the Senior Executive Programme at Harvard University. His appointment brings considerable national and regional experience to the advancement of the rights of persons with disabilities in the global arena. He has assumed numerous positions in the fields of disability, governance and administration at the national, regional and global levels, including: Senior Policy Analyst in the Presidency of South Africa (2006-2007); Chief Executive Officer of the Secretariat for the African Decade of Disabled Persons (2003-2006); and Director of the Office on the Status of Disabled Persons in the Presidency of South Africa (1996-2001). He has worked closely with the United Nations, the World Bank and other entities of the United Nations system, as well as with bi-lateral donor countries in Europe and other regions. The mandate of the Special Rapporteur is to monitor the implementation of the Standard Rules on the Equalization of Opportunities for Persons with Disabilities, adopted by the General Assembly in 1993, and to advance the status of persons with disabilities throughout the world. Bengt Lindqvist (Sweden) was the first Special Rapporteur, holding the position from 1994-2002. The second Special Rapporteur, Sheikha Hessa Khalifa bin Ahmed al-Thani (Qatar), was appointed in 2003 and served until June 2009. See all the reports and related documents of the Special Rapporteurs.